Cortona is the setting for Frances Mayes’ novel Under the Tuscan Sun, and a later film version. 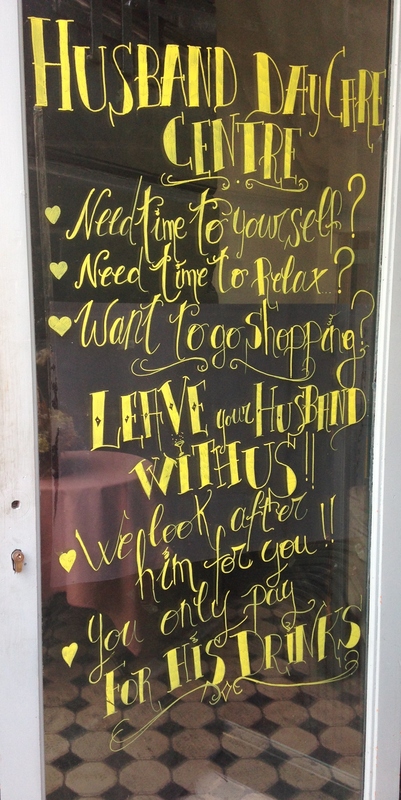 It was a highly popular novel and I think every woman’s dream to flee the daily grind of marriage, kids, work pressures or anything else that ails you and arrive in the charming Tuscan town of Cortona. Finding a derelict house and turning this into a bucolic masterpiece along with all the romance of the Tuscan countryside. 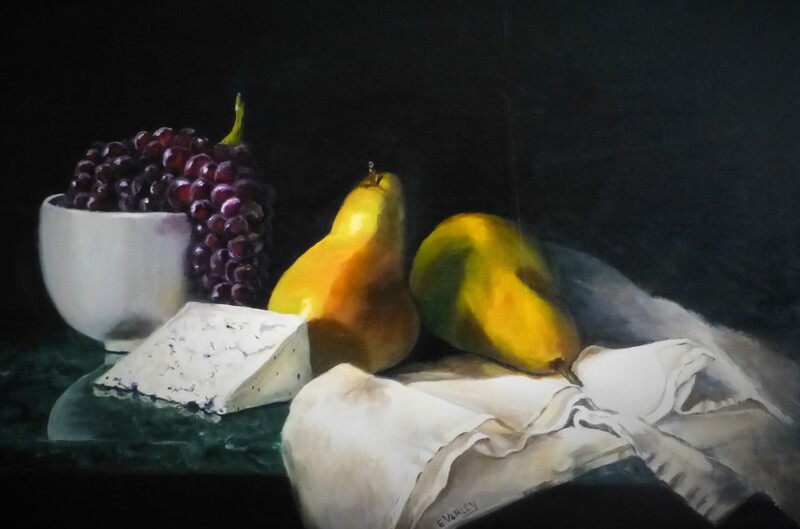 I was in Tuscany to discover another kind of masterpiece…a painting. Not one by Michelangelo or Leonardo but one by me. I was joining a painting group for a week of tutoring and plein air painting – that means you pack up your kit and find a view point in the countryside or town and sketch. Finding a suitable spot can be pretty daunting when you have a quintessential Italian scene around every corner. With that handicap of sensory overload I resorted to nourishing myself with other Italian delights. Sitting in a bar and sipping on an aperol spritz or strolling along the street enjoying a wonderful gelato. My fellow students were inspiring as they embraced the task admirably and turned out some excellent work. Our tutor was on the ball and encouraging everyone at every opportunity. His morning demonstrations were mind boggling as to how he captured the mood, light and aspect of the various scenes all with large one inch and 2 inch brushes. I have a new resolve now to return home and tackle painting landscapes with a new vigour. You ask what else did we do apart from painting? Some sight seeing and of course eating. This week’s highlights have included….carpaccio (raw beef sliced paper thin with grated Parmesan cheese arugula and olive oil), handmade fettuccine with grated truffle, risotto with scampi, anchovies all sorts of ways, pizza with wafer-thin crust with fabulous toppings, fresh porcini mushrooms lightly battered and fried and the most wonderful veal limone. Of course it is obligatory to end the evening with a limoncello to aid digestion and sleep. More culinary delights are on the horizon. Italy – The Love Affair Still Goes On! Here i am again – in Italy. The magic of Italy still endures after an absence of three years. Like a long love affair – you remember everything so fondly and forgive its shortcomings and failings. These failings manifest themselves as soon as you step off the plane. The Rome immigration hall is a game of snakes and ladders where the queues of people are ushered around a ribbon of people control barriers. A thousand deep and the line continues to grow as more planes land. Finally the immigrations desks come into view, and of course out of the 20 plus desks there are about 10 manned by very disinterested officers. Mine was a forty something lady officer (she had that very lived-in look) who had her earphones jammed in so tight that she could not possibly hear the moaning of the throng behind me. I arrive at the QC Hotel Terme Roma late at night and hit the shower and bed in quick order. On awakening and opening the curtains the Italy that I love is revealed. Those oh so very Italian umbrella pines, the towering plane trees with their marvellous dappled trunks, the chirping of the sparrows and swallows and that lovely sound of water falling into the magnificent fountain below. The view over the terracotta roof tiles and chimneys is a welcome site and reinforces the sense of where I am. My first morning is spent with the maintenance man Marco and his cappo (bosss) while they try to crack open the safe that refuses to open. It is amazing what can be achieved with a large wrench and a few screwdrivers aided by a constant monologue in Italian by both of them. After 15 minutes of judicious banging allora – the door flies open. They both beam that safecracking can be added to their cv’s. Maybe they will go home and watch the Italian Job and give their expert opinion on the safe cracking scenes. Another week has passed by in a bit of a haze. After spending 4 hours every morning in Italian lessons trying hard to look on the ball and somewhat engaged, I find that my head is spinning by 1.00pm. The lessons are conducted all in Italian – totally from wow to go. To add more pain the use of dictionaries is prohibited. When you have a question, the teacher attempts to ease your dilemma by using a convoluted example in Italian and by the time he has finished his explanation, you have hopefully grasped the concept. This week we had a new bunch of recruits from Holland and Germany and Australia plus the same 2 chaps from Japan (one of which is a right pain in the backside!) -10 in total. Consequently, the group exercises are like deciphering Morse code with cotton wool stuck in your ears. It is all babble! What really did my head in was our final exercise on Friday – a passage (about an A4 page) that we had to read, translate and then undertake some grammar exercises. The subject was about a scientist who became fascinated by snails and wanted to write a book about the life of snails. However, no matter how he tried to conceal himself in the bushes, the snails were up to his tricks and hid inside their shells. So he had a bright idea of disguising himself as a snail. He made a shell out of paper mache that he could fit himself into, a rubbery nose with rubbery horns that waggled about and silvery saliva that he painted onto the ground. This pastime quickly turned into an obsession, and eventually he was sleeping in his costume and asking his wife to make him worm fritters. She in the end, told him he was a loon and he could stick his worm fritters and left! Now – I am confident that in my next conversation with someone about snails and worm fritters I will be able to acquit myself well. Handy don’t you think? On the plus side, I feel more confident in conversing with the locals in Italian (not about snails). Some are very patient and will give you time to express yourself. Others revert to English straight away. At least no one is speaking German to me. There are plenty of Germans and Dutch here but very few Asians. Lucca is a really pleasant and friendly place. The city is flat and cars are not allowed in the walls unless you have parking permits and a place to park, which are very limited. Consequently, this is a great place for a bicycle and which there are hundreds. The streets are narrow and cobbled with the buildings rising up on either side for three or four stories containing 4 to 8 apartments where the residents live in close quarters with each other. So hearing the domestic chatter (and arguments) from your “vicini” is not unusual. For example the family who live behind me have a toddler named – wait for it… Galileo! My goodness he has a big name to live up to. The best sight of the week was when I was on my way home from class, I passed a couple of older ladies (70’s) – done up to the nines. Blonded hair (yes, I am a culprit of some chemical assistance in this department), large pouting red lips (possibly some filler, and Botox to boot) skin tight black pants and patent black boots, rather flashy jewellery and pushing a very smart baby pram with a hood. From the back they looked like a couple of glamourous (!?) grannies out with the new baby while mum is at work. As I drew closer, I looked into the pram – my jaw hit the ground – there sitting in pride of place was not a baby but the biggest, white, furry cat I have ever seen. I have since discovered that this was a state of the art bespoke cat pram. Can you believe it! Today I am indoors as it is raining and thundery. So I have been busy doing some catch up homework in readiness for class tomorrow. Please God, no more stories about invertebrates please? During language class this week we had to discuss an opinion survey that was recently conducted in Italy. One of the questions was; “what do foreigners rate as the most significant aspect of Italian life”? The majority of respondents said, ” il cucina” . I agree, as I am never disappointed with what Italy has to offer. As the scenery in the regions of Italy differs, so does the cuisine. Here in Lucca, I have enjoyed some interesting and tasty local specialties which I have not experienced elsewhere. I am looking forward to many more to come in the next few weeks. Just to mention a few of the highlights: proscuitto with white figs (peeled), cuttlefish stewed with tomatoes and spinach, tartare of veal with a tuna mayonnaise with bottarga (a cured fish roe), fresh farfalle pasta with sauteed fresh tomatoes and fresh salmon and basil, grilled and sliced rare fillet steak with parmesan cheese on rocket (sauced with olive oil and balsamic vinegar, grilled sea bass with buttered spinach and slices of crispy potato. Not to forget the gelato. I have discovered a wonderful place where they create gelato magic and makes their own flavours – not the run of the mill fare. Interesting and unusual so in the name of research I have three scoops of different flavours! Apart form the cuisine, the other obsession that Italians have is news and politics! I am still trying to digest the Italian slant on “news”. It swings from the latest gruesome homicide, to the refugee crisis, and a swathe of political stories in between. Maybe it does sound like just like home! There is an abundance of news commentary programmes here. On every second channel there is some beardy bloke with too long hair, that needs both a wash and a brush, and wearing designer glasses sprouting his informed (and ill informed) opinions depending on which side of the socialist spectrum you sit. They think that Greece is a laughing stock of Europe but they do not realise that they are only one step away from the same fate. Hard work, punctuality, precision, good governance, innovation are not in the Italian vocab. Maybe that is why we love it here. The whole sense that life has gone on like this for centuries and if we don’t rock the boat, long may it continue. 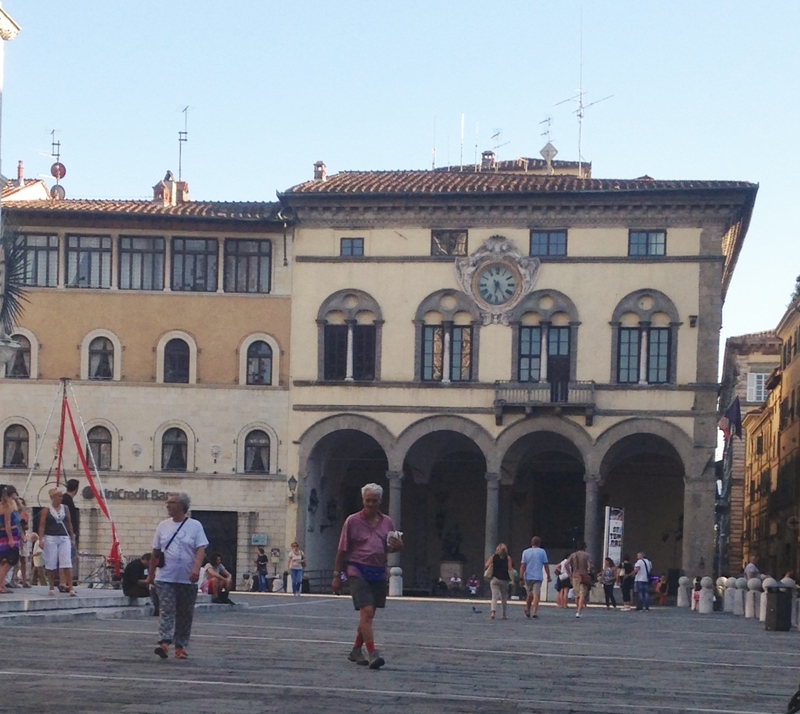 Here I am in Lucca – having enjoyed 2 days of sunny warm weather– up 30 degrees. This is ideal weather for sitting in a shady spot and drinking an aperol spritz (or a glass of prosecco) and watching the passing parade. After a few rainy and cool days in London this feels like coming home. Italy has that instant appeal of warmth, friendliness and accessibility. On arrival at Pisa airport, I was met by Francesco my taxi driver to Lucca. He did not speak any English so my rusty Italian got a rude awakening. I think that I acquitted myself well as he did not drive off the road in fits of laughter at my linguistic abilities. We arrived in Lucca, unloaded my cases at the front door of my apartment (rented through AIRBNB), and rang the bell (twice) and with increasing urgency. Alas – no answer. Francesco had a worried look on his face. I am sure he thought that he might have to take me home as an unexpected boarder. I had a fleeting thought that I could be one of the cases that wary travellers fear – an internet scam – there was no apartment and some slippery scammer had my money. I found my landlord’s number and Francesco called it for me. After a number of rings there was an answer and Francesco informed them that their new lodger was at the door. He then told me (in Italian) that my prospective landlady was in hospital after delivering her first baby at 8.30am that morning. Dad would be on his motor scooter and be there in 10 mins. Phew! In ten minutes he rounded the corner on one wheel and zipped up the lane full tilt; off came his helmet and I was greeted with a grin from ear to ear. Obviously he is a very proud new dad. And today Mama and baby came home. There was a knock at my door and the new family was there to show off the incredible tiny bundle – Ginevra. I have already offered myself for babysitting duties. My apartment is spacious, comfortable and spotlessly clean. It is located on the edge of the old city inside the walls that ring the town. Completely surrounding the ancient city, the walls we see today date back to the 17th century. They are crowned by 4 km of green parkland, where people walk, cycle or stop for a picnic. Just another example of how, over the centuries, though buildings last, their roles metamorphose as times change. I have explored some of the streets and squares nearby. Everywhere is walking distance and is quite flat – so pedestrians and bicycles rule the road. The public buildings are very grand, old palaces with wonderful medieval facades, impressive churches, twisting alleys that open onto small piazzas. Behind high walls one can glimpse gardens and courtyards. The streets have been full of tourists and holidaying Italians enjoying the last days of the European summer vacation. 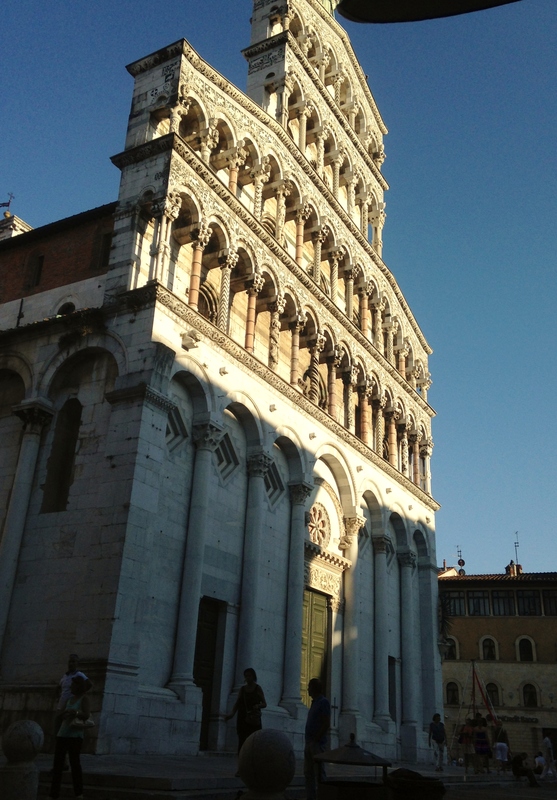 Hopefully this week I will see a quieter Lucca and be able to explore further afield. Tomorrow is my first day at school – so more of that later. Greetings from the Southern Highlands. The leaves are now turning on their magnificent autumn display. I am amazed at the intensity and vibrancy of the colours – bright yellow through to the deepest red and every hue of rust in between. I almost drove off the road as I was too busy admiring the beautiful scenes in Kangaloon. Isn’t that a great name! Almost as good as where I live – Burrawang! Anyway, as I was reminiscing, time has certainly flown this year and it is already May. One of the cultural highlights of the year so far was the Robertson Agricultural Show. This is certainly a red letter day on the local calendar. As usual, it rained. It is always great fun to visit a country show and tromp about in the mud carefully dodging cow pats and puddles. The day started with a visit to the poultry pavilion with its fine feathered specimens. All the exhibits were crowing, cackling and quacking in unison. What a marvelous cacophony. The dog judging arena is a must see. I am amused by the handlers let alone the dogs. The canines are primped and coiffed to perfection. They are certainly prissier than any blonde going out on a Saturday night date – as the saying goes “the bigger the hair, the closer to God”. The amount of hairspray and blow-drying that these pampered pooches endure is beyond the pale. Why is it that dog people grow to look like their dog? In the main show pavilion one can enjoy a display of assorted local arts and crafts but the big ticket is the cakes and preserves. The local ladies are stiff competition but I am not daunted as next year I am going to enter my sponge cake so stand by for a big announcement of my winning entry in 2015. My particular favourite is the children’s vegetable modelling. I had no idea that 5 potatoes of varying sizes and a number of toothpicks could be sculpted into a horse. What imagination! A trip to the show is always topped off by the sight of handsome cattle, fine looking horses and men wandering around in big hats. The lead up to the show always has the village abuzz. Our local butcher, Darryl is a very civic minded chap and he creates the Robertson Show in miniature outside his butcher shop for all the locals to enjoy. All the children in the village bring their toy tractors, trucks, cars and a variety animals with which Daryl works his magic. He creates a fabulous miniature show with various events including the now famous potato sack carrying competition. The sight of Barbie crowned as Miss Robertson Showgirl is a hoot. Well done Darryl. I am looking forward to next year’s Robertson Show. There is nothing like a country show to bring out the community spirit. Marriage is a loose affair in Namibia, and for that matter many other parts of Africa. Polygamy is still practised in many tribes. It is a common custom that after years of marriage the husband will select a new wife to join his household. The number of wives depends on his wealth. A wealthy man owns a large herd of cows, goats and sheep that will enable him to pay the bride price. He will also need stamina to service multiple wives as there is an expectation that everyone will share his bed. Hence, families are large, complex and extend over many locations and tribes. Family succession is an important issue that has to be resolved. The family always looks to the headman for leadership and to make decisions that will affect them all. These decisions can be trivial day-to-day issues such as family arguments, or important matters such as marriage and property disputes. When the husband decides it is time to select his successor as head of his family, he elects the eldest son of his sister. He asks his nephew to come to his home and stay with his wife or wives for a couple of weeks so they can “get to know each other”. During this period, the husband leaves the village and goes off hunting or visiting distant friends and relatives. Meanwhile the nephew is taken into the family and is given all the rights and respect of the husband. On the husband’s return, the nephew moves out of his uncle’s house and the uncle resumes his position as head of the household. On the death of the husband, the nephew comes to his house and takes his uncle’s wife or wives to his own house and they then join his family. Hence, in a tribe, everyone is related by blood or by adoption. There is a shared responsibility for the caring and nurturing of all children. No child is ever left homeless should something happen to his parents. Another important issue is inheritance. This importantly determines the person’s status and ability to pay a larger bride price to attract more desirable women into the family. If inheritance is determined after death, should the man not have selected his nephew by the time he dies, the tribe believes that the dead person was “witched”. To determine who will then take the dead man’s wives, family and possessions, six eligible men of the tribe are nominated to carry the “witched coffin” until one of them feels that the dead man inside the coffin moves. This signifies that the ancestors have chosen his successor and the person who “felt the coffin move” inherits the wife or wives, house, cattle, possessions and children. Many people have conveniently blended their traditional beliefs and values into Christianity. I met Jonas’ uncle Nicky. He and Jonas are like brothers as only a few years separate them in age – they went to school together and now both are guides at neighbouring camps in southern Namibia. Nicky is devilishly handsome, with a wide warm smile that showcases his perfect white teeth. He is wearing a large gold cross around his neck and when I asked him how all these tribal customs rest with his Christianity, he replies,”he is very comfortable”. He can reside in the belief that both can co-exist. It seems that the people “cherry pick” what they like from both belief systems and blend them into a framework which dictates their current social and spiritual norms. For example, when Jonas was born he was given two names. Those being: Jonas from his grandfather, who was a Christian and a tribal name of “Kakumbire”, which translate to “he didn’t pray when he passed away”. The name Kakumbire came about when Jonas mother was pregnant with Jonas, his grandfather was very ill and everyday it was his custom was to offer a Christian prayer. However, the day he died he did not pray and hence this sentiment was captured in Jonas’ Himba’s name, “Kakumbire” -“he didn’t pray when he passed away”. Traditional spiritual customs are not the only things that co-exist with modern practices. Male circumcision is still widely practised. When the village has a number of children to be circumcised they call in the “specialist”. Each family has to buy a new blade and pay the specialist $100 Namibian (AUD20.00) each. After the deed is done, they apply a paste of paraffin and roasted herbs, which is then applied to the wound. This is slowly worn off as the cut heals. However – the most painful tribal practise is the knocking out of the four bottom teeth in the females and males. Luckily this is not commonly practised by modern Himba but is still widespread in the tribal areas. The headman is designated to carry out this ritual by taking a nail and hammer or two stones and knocking them against the gums where the roots of the teeth are. This sounds horrifyingly painful, and no doubt it is. This practise occurs at puberty and is important part of the Himba culture that easily identifies them as Himba apart from wearing the distinctive traditional Himba clothing. The traditional costume and grooming includes dressing the hair, particularly for the women. They braid their hair thickly with a mixture of red ochre and animal fat. These braids are finished off with large fluffy pompoms of hair at the ends. The women “bathe” their bodies all over with the red ochre/fat mixture, which makes their skin very soft and it becomes like a burnished brown colour. Their necks, ankles and arms are ornamented with a variety of jewellery, belts and metal work. They wear around their waist a small skirt of goat hide which covers their bottom and in front a small cloth for modesty.